Currently, billions of people are using smartphones on varied platforms like iOS or Android. For the purpose of Mobile App Development, one requires certain frameworks. Smartphones generally function on various platforms and for developing applications for these platforms, tools which support the development of cross-platform app are required. There are various alternatives available and selecting a proper tool will definitely support you to develop an app which is much better than others. The market for mobile app development tools is rapidly expanding. As per Forrester, more than 60% of undertakings are already indulged in cross-platform development, in the meantime, Gartner anticipates more than 20 million enterprise app to be developed by the end of the year. These will definitely help you in developing a cross-platform application, but the dilemma is how to select an ideal framework from these alternatives. How to make a smart decision and select which tool to use for application development? All the four technologies permit you to develop real native mobile applications for Android as well as iOS without any requirement to learn languages such as Kotlin, Java, Swift or Objective-C.
Flutter is a programming language which is built by Google. Flutter is also built by a Google team. It is a framework for dart along with being a software development kit. The concept that Flutter uses is that the dart codes are assembled using native code that functions on the target device. Dart along with flutter framework can be used effectively to develop user interfaces composed of widgets. Flutter offers some pre-configured widgets like tabs, buttons and such and these are generally utilized to develop a personal and more complicated widget by the user. Apart from drafting codes for Flutter and Dart, the user also uses the SDK part of the technology this is a set of functions that support the user in the flutter app development process. It is essential to note that similar to normal react applications developed for the browser, HTML tags cannot be used here, instead of that the user is allowed to use some pre-developed elements are assembled with native code with the help of React Native toolchain. It offers the user the alternative of functioning with the various frameworks as various courses of actions are built independently of each other. So the user may have a great time or better built-in-component with alternative A that they have with alternative B. All alternative is under dynamic development and therefore it is ideal to just buckle down to the docs. Similar to React Native and Flutter, Native Script also delivers the user a bunch of pre-developed elements which they can make use of to build the user interface. It does not function with HTML but with its personal elements such as React Native. Towards the end, as a web page is created, Ionic is quite an effortless option for new web developers. Ionic is generally a massive suite of elements you can make of like cards, buttons, etc with any fronted framework. Ionic also offers several tools that make the development of mobile application very simple and it also assembles the app into a deliverable package. After drafting a short introduction of each of these alternatives, now we should strike the point of differences by watching outright completely objective norms. This norm exhibits the proportion of codes the user write can be reused for platforms like Android and iOS. This can be needed to compile components differently or to utilize various UI elements because not all kinds of UI components are available for both platforms. 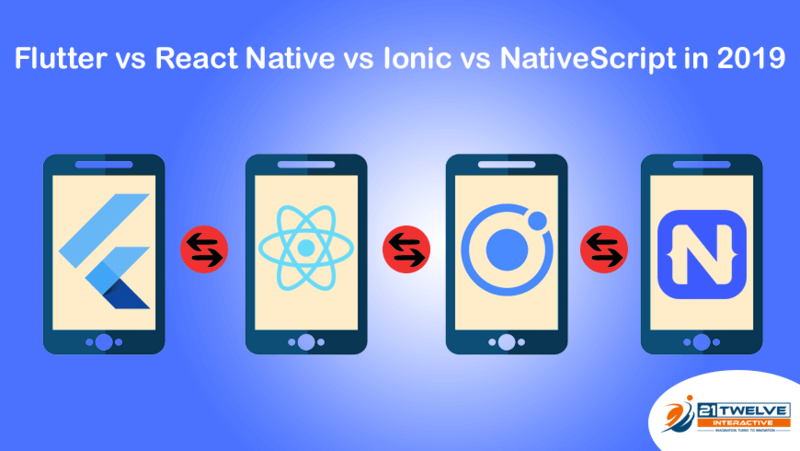 A massive amount of reusability can be seen in Ionic apps but Flutter, Native Script and React Native shows a lesser amount of reusability. This norm seems pretty much similar to the prior one but in reality, it is an entirely different concept. Though if the user has to modify some codes to the fundamental platform, the question arises that how complicated is that modification? Do the users have to learn several types of language characteristics for various platforms? All alternatives only have to be learned once, just in case of native languages the user has to learn two kinds of languages. Is it simple to flourish a powerful UI? Do the users have to build and draft various kinds of UI elements individually or are they well-equipped with a lavish ore developed collection of elements? Are that the elements accommodation to the fundamental platform immediately? This is the basic concept behind this norm. This offer mixed results, for ionic platforms the elements offered immediately awaits to the platform the app functions in and hence develop a beautiful native app. Flutter also offers a comprehensive suite of previously developed widgets. Native Script offers a decent set of UI component which includes the basic set of components used. React Native offers a decent set of previously developed elements but several of them require to be designed by the user. Is it simple to search for help and are there sufficient third force libraries present to add that one property that the application requires? Having a bright third force library is a great thing but how famous is an alternative? This is not essentially the same, as the user can have a lush ecosystem because an alternative is compulsory in the industry without it being famous among the web developers for window app development. After Native languages which are the most famous option, Native Script crawls behind. Ionic seems a pretty famous alternative and flutter is quite close to ionic and is extremely trending these days. The title of this norm speaks for itself, how do various kinds of technologies are considered from the point of view of run-time performance? For this native languages is considered to serve outstanding accomplishments. Ionic provides worse performance because it is a wrapped web application. Flutter, Native Script and React Native, these three provide real native apps and hence they serve a better performance than ionic. The mobile application most probably has to some sort of native device property such as the camera or GPS. How simple it is to reach the feature? And how simple it is for comparatively fresh properties such as AR APIs offered by iOS or Android? This norm also shows mixed results. Ionic makes use of Cordova or its personal solution, Capacitor to offer the user access of native device property. Iconic offers a satisfactory package to reach properties of native devices such as a microphone or camera. In flutter, the user is forced to search for third-party packages if they desire to reach native features such as the camera. Such packages are present because of the irrational ecosystem. In Native Script it provides an utterly decent set of plugins that serve you access to essential native device features. Moreover, it is simple to connect with the personal native did to native script apps. React Native is the most famous solution where you acquire a lush set of third-party packages along with priority developed APIs for reaching native platform properties. It is excellent if you are satisfied regarding technology but it is important to know about how the rest of the world thinks about it. This may not be of any significance for you but just in case it does here is a brisk comparison. Mixed outcomes can be seen, in the case of ionic there is no wholehearted winner app but it comes with some beautiful exhibition of apps that are utilizing it. Some big business housed are making use of ionic as the speed of developing an app is very appealing, and moreover, it is a great alternative for small business houses as well. Flutter is competitively fresh and does not have gigantic firms under it, except Google. Native Script has some huge names in its exhibition, largely firms belonging to B2B technology space. But it has no popular application in the B2C industry. For React Native, it is utilized by a number of large firms including Facebook. So, which is the best alternative to select? With all the above mentioned norms-which one should you select? There is no bad alternative, these are all mind-blowing options. Firstly, the user requires deciding whether they desire to keep functioning with Native languages and accept the demerit of learning 2 languages and coding 2 apps. Mastering 2 languages and platforms need a lot of hard work and time. But if the user is versatile enough to use let go native language, and then he has to decide whether a wrapped application solution which ionic provides, will work for those. Although it has a demerit of performance, the user will get a super fast development experience. They can use their web development knowledge and develops two separate application with just one tech stack within no time. But just in case performance is the priority of user, or they require to access a lot of native devices features they may desire to watch out the functioning of Flutter, React Native app development or Native Script. All these three alternatives that are flutter app development company, React Native or Native Script offer the web developers the merits of performance as well as speed.